The Milky Way behind an ancient bristle cone pine tree in California. Welcome to Part 2 of a 3-part article on shooting the night sky. Part 1 focused on settings and image capture. Part 3 will be all about creating star trail images. 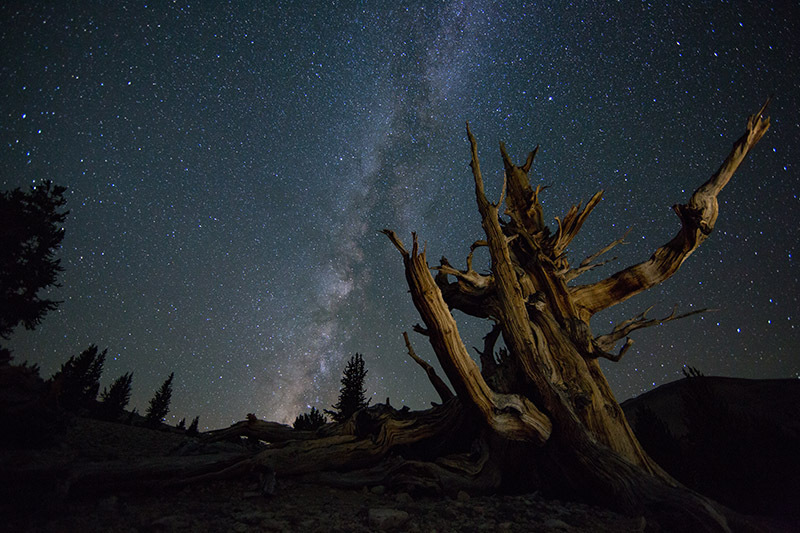 For Part 2, I’ll go through in step-by-step format how I processed the above image of the Milky Way in front of a light-painted ancient bristlecone pine tree. This was done using some fairly basic techniques in Adobe Lightroom and Photoshop. Many of the same techniques can be applied to other night images, such as Aurora Borealis shots. My processing involves making many subtle adjustments to the image, as opposed to just a few drastic changes. That, combined with how small the pictures are in this article, mean that you will not see a lot of difference between some of the steps. I started by increasing the exposure slider to get an overall “proper” exposure. You can see below the exposure level I arrived at in this first step. I had used auto white balance in camera. In Lightroom, I moved the color temp slider left to increase the blue tones a bit. I left the tint slider alone, although I sometimes add magenta. I then jumped down to Lightroom’s effects panel and experimented with the dehaze slider. I settled on +20, which is high but worked well in this case. Because the dehaze slider affects color temp, I went back and tweaked it slightly. Leaving contrast at 0, I adjusted the highlights, shadows, whites and blacks sliders. Each image is different, but here I brought down highlights, increased shadows slightly, brought whites down slightly and blacks up very minimally. The basic idea is to get some detail in the shadows (unless you want a silhouette) while maintaining contrast in the image. Don’t go too crazy lightening shadows or you will lose too much contrast in your image. Continuing down the basics panel, I left the clarity slider at 0 because we will apply clarity later to the Milky Way using a local adjustment. I added vibrance (+21) and saturation (+4). The image is still looking somewhat flat at this point. Next, I added some punch to the image using the whites and darks sliders in the tone curve panel. I moved lights up quite a bit (+43) and brought darks down moderately (-18). The idea is to bring some contrast to the image. I left sharpening at Lightroom’s defaults of amount (25), radius (1.0), detail (25), and masking (0). I brought in some noise reduction due to the high ISO I used. Keep in mind that noise reduction removes some of the detail in your image. In this case, I increased luminance noise reduction to 25 and left color noise reduction at 25. If there was color noise in the sky, I would have increased color noise reduction. Using Lightroom’s adjustment brush, I brushed over the Milky Way and increased clarity, in this case up to +35. This really added some brilliance to the Milky Way. Adding a new adjustment brush, I brought up some of the shadowy areas on the ground by brushing over them and moving the shadows slider right. The tree looked good, so I left it alone. Using the radial filter tool (located to the left of the adjustment brush tool) I created a vignette by drawing an oval which covered the majority of the image. I pulled the exposure slider left to create a subtle, feathered vignette along the outer edges. You could also wait until later to do a vignette if you prefer. I usually open night images as a smart object in Photoshop. This is so that I can make further adjustments to the RAW settings within Photoshop if I want. I first added a pretty strong Orton Effect to the image, masking out the foreground so that the effect was applied only to the sky and tree. You can read about how to create this effect in the July Issue of Inspirational Photography on pages 18-19. Here is the updated image after Orton. You can see that this made quite a difference. I almost always create a curves layer late in my workflow and experiment with color balance. I added the curves layer and went into each color curve separately. This is done by using the curves pull-down box and changing “RGB” to “Red”, putting a point right in the middle of the curve, and then using the arrow keys to move the curve up and down to improve the color balance. After the red curve, I went to the blue curve and did the same, followed by the green curve. To add a little more detail to the ground and tree, I added Nik Filter’s “Detail Extractor” (found in ColorEfex Pro) and reduced the opacity to 12% on the Photoshop layer. I masked out the effect from the sky so that only certain areas of the tree and ground where I wanted more detail were affected. Lastly, I used Nik’s Viveza to brighten the image, which added punch. I also added a slight bit more contrast and saturation. My workflow always ends in Lightroom with some additional tweaks. In this case, I added a bit of warmth and magenta (with the color temp and tint sliders), increased the exposure, added some more contrast and a bit more saturation. Below is the final image. Posted in Processing Tips on January 16, 2017 by Ken Koskela. ← Previous: "An Introduction to Shooting the Night Sky: Part 1 – Milky Way, Stars & Northern Lights"